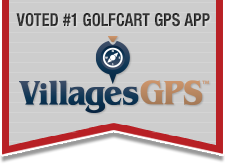 Talk of The Villages Florida / Recreation in The Villages / Golf in The Villages / Straight 9 Holes ??? No stopping at the 'turn' (after 4-1/2 holes)...to eat lunch? Seriously - Although I don't play executives, I'm guessing they are giving the option (and giving you tee times) to play the two execs consecutively...to make 18 holes. I believe that it has to do with the summer crossover times. If you just want to play nine holes you have to play at these times. But call them to see.